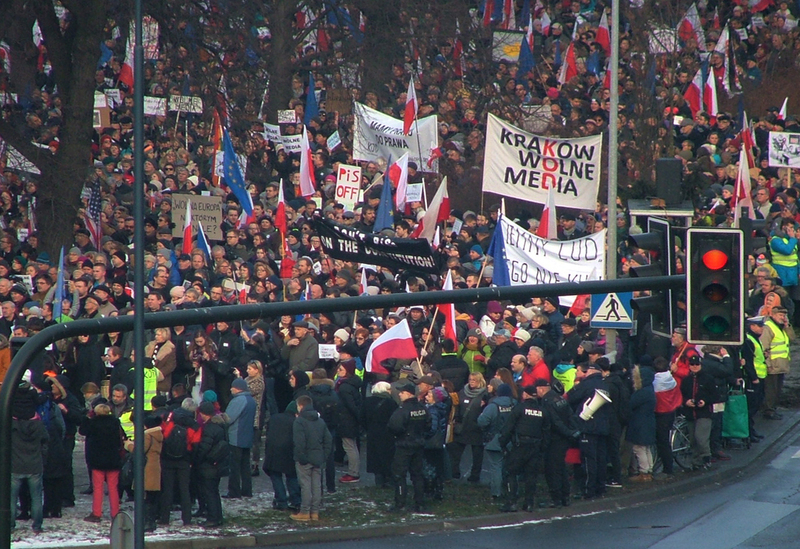 Private news broadcaster TVN24 has been fined nearly 1.5 million PLN ($415,000) by Polish media regulators for its coverage of protests last year. The National Broadcasting Council (KRRiT) charges that the channel’s reporting violated the media code, which prohibits “promoting illegal activities and encouraging behavior that threatens security.” Though members of the ruling far-right Law and Justice (PiS) party have called the coverage “fake news,” no specific violations have yet been identified. Media watchdogs worry that this is just another example of the erosion of press freedom by the Polish government since PiS came into power in 2015. New rules have placed public broadcasters under greater government control and restrict public advertising in independent opposition newspapers like Gazeta Wyborcza. They have also mulled placing restrictions on foreign investment in Polish media in order to “re-Polonize” it. The protests last December for which TVN24 is being penalized for covering were against new restrictions on media access to parliament and its sessions. These changes have led Reporters Without Borders to lower Poland’s ranking on its annual Press Freedom Index from #18 in 2015 (before PiS took power) to #54 of 180 this year. TVN24 is the most-watched privately-owned news station in Poland. Its parent company, US-based media group Scripps Networks Interactive, said the fine is based on “an extremely biased and careless report” and plans to appeal against it. The appeal would most likely be heard by the District Court in Warsaw. But it is dubious whether TVN will find a sympathetic audience there. Polish Minister of Justice Zbigniew Ziobro used controversial new court controls recently instituted by the government to dismiss three vice-presidents of the court and appoint its current president in September of this year. Danielle Forest contributed to the reporting of this article. So it was both fake news, didn’t happen, and real news, because it must have actually happened. What a joke. Enjoy your new fascism Poles, you voted for it. It would be churlish not to wish Mr Morawiecki anything but good luck in his new position, especially with the Season of Good Will approaching, but the fact remains that policy is still likely to be directed by a certain J. kaczynski, supposedly ordinary member of parliament. A contradiction in Mr K’s strategy seems to have appeared. The discarding of a popular prime minister in favour of someone who might be more on the wavelength of Western partners sits oddly with the treatment meted out to a TV station which could well alienate those very same partners. I’ll rephrase that. The government’s treatment could alienate the partners, not the station. The TV station is being penalized for reporting the news. This is Poland 2017. The US State Department has already expressed concern. No doubt keen legal minds will pore over the detail, but I will offer, if I may, some rather sketchy observations. The charge made by the regulator KRRiT against TVN24 is of overall bias against PiS, the ruling party. The claim is that the manner in which the events in and outside of the Sejm in December of last year were presented served to encourage demonstrations against the government. Obstruction by the opposition inside the Sejm and demonstrations outside of the building were not reported objectively, according to the regulator. The KRRiT ruling alleges that some studio guests were openly biased against the ruling party and some individuals encouraged viewers to join the demonstrations. Dziennikarze TVN 24 relacjonując przebieg demonstracji pod Sejmem RP powinni poinformować widzów o rozwiązaniu zgromadzenia niezwłocznie po podjęciu takiej decyzji przez Policję. Wstrzymanie podania tej ważnej informacji należy uznać jako zachęcanie do dalszego łamania prawa. Another charge made against the TV station is that the analysis of studio guests presented a vision of an emerging authoritarian state. Całość dopełniały wypowiedzi ekspertów, którzy dokonując analizy wydarzeń, przedstawiali wizję powstawania państwa autorytarnego. Studio commentators are accused of having been biased and alarmist. Some talked about a possible use of force by PiS authorities. There is even an objection to the use of news tickers on the screen which quoted very “emotional pronouncements by politicians”. Cytowano z reguły bardzo emocjonalne wypowiedzi polityków. W świetle przywołanych powyżej stanowisk, w celu ustalenia, czy doszło do propagowania przez nadawcę działania sprzecznego z prawem, wystarczająca jest ocena treści i formy audycji oraz sposobu korzystania z różnych środków wyrazu takich, jak dźwięk, obraz i słowo, sposobu kadrowania i montażu, a także sposobu prowadzenia audycji, dobór uczestników audycji, a zatem nie tylko treść komentarzy, ale także ich brak. Some thoughts: Media organisations do have a huge responsibility to report events truthfully and, as far as possible, without bias. But in the absence of a coherent opposition, it could also be argued, who but the media can effectively put a brake on government overreach? In the specific case of Poland, the problem of accountability is compounded by traditional hostilities. The language and insults coming from both sides of the political divide make for an unedifying spectacle. When the opposition are branded “enemies” and “traitors”, then the country’s politicians have learned absolutely no lessons from history. Final comment: I don’t know whether there is any substance to the regulator’s accusations because I wasn’t there at the time, but I thought I would offer a flavour of the ruling for non-Polish-speaking readers. I believe I’m right in saying that this same regulator has never suggested that there is any bias in the other, openly pro-government TV station.